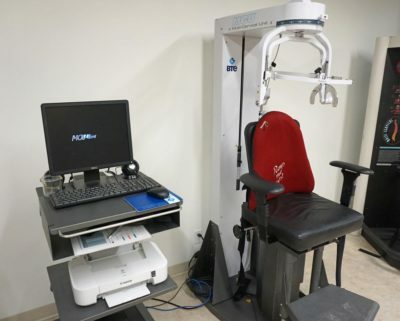 MCU™ Multi-Cervical Unit is the most effective and complete system for the assessment and concussion rehab of patients suffering from neck pain, whiplash associated disorders (WAD), and general cervical spine disorders. The MCU is a technology-based machine specifically designed to assess objectively and treat chronic neck pain and related conditions. Based on your assessment, our experienced practitioners design a customized rehabilitation program on the MCU for a cost-effective and long-term solution for your neck pain and disability. Most people will find that they get significant relief of their neck pain simply by strengthening their neck with the MCU. Using the MCU, we can measure your neck strength in 16 directions to see which of your neck muscles are weak. We will then help you strengthen those neck muscles and retest to make sure you are once now strong in all directions. Just as importantly, we will make sure that you are balanced left to right and front to back. book your Calgary Neck, Headache and Concussion Rehab consultation appointment today!